Niagara Black Stripping Pad 7200N maintains consistent high performance throughout the life of the pad. 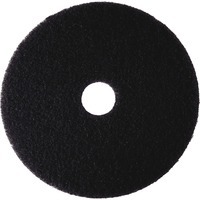 It is an ideal pad to strip finish as well as remove dirt and buildup. Use it on a rotary floor cleaner at conventional speeds from 175 to 600 RPM. 20 pad has a long life and is washable and reusable.